Those of us warning that American democracy is threatened have still been stunned by how fast. Political polarization elsewhere has led democracies to collapse. Polarization here has largely been the unintended consequence of a legal transformation. But the cure may be even worse. Over the past half-century, legal changes fractured the media by helping cable television and available broadcast channels expand. Before fake news became an industry, the fractured media promised us a more democratic marketplace of ideas. But it made us a fractured audience, no longer watching or hearing the same news. Court decisions eliminated liability for innocent misstatements that defamed people. The fairness doctrine once required all broadcasters to provide balanced coverage of controversial issues of public import. It was dismantled in the 70s. Now TV and radio are much more one-sided. A new statute and court decisions gave internet providers immunity even for fake news. The internet rapidly became both the intended source of valuable views and information, and the unintended bastion of garbage, leaving readers, viewers and listeners much less well-informed about the competing arguments over public issues. Meanwhile, courts and state legislatures put presidential primary elections firmly in control of the nominating system. Primaries often drive candidates to the extremes to capture majorities of their own parties, not toward the center to capture independent voters. Instead of balancing each other, therefore, the media and nominating systems increasingly radicalized each other since the 1970s. President Theodore Roosevelt once said “the military tent, where all sleep side-by-side, will rank next to the public school among the great agents of democratization.” The draft ended in the 70s, a casualty of our disagreement about the war in Vietnam. The public schools have been hollowed out by charter schools and re-segregated with the help of suburbanization, zoning and Supreme Court decisions after Rehnquist took its helm in 1986. So neither schools nor the draft bring us together as they once did. Federal agencies were at the heart of segregating the suburbs before and even after Brown v. Board, deepening polarization in the process. Financial institutions only compounded the damage with their sub-prime loans. In this polarized, divided, segregated era, the Court in Washington decided the nation’s most contentious issues of race, police behavior, school prayer, abortion, equal rights for women and people with differing sexual orientations. These were mighty battles over justice with enormous consequences. Mildred and Richard Loving could marry and live as a devoted couple near their relatives in Virginia despite their difference in racial origin. Similar opportunities opened for women, African-Americans and members of the LGBTQ community. Some went free who would have been hanged for crimes they did not commit. But the Court’s decisions sharpened the polarization among us. Where now can we hold a “national conversation”? In a fractured media? In a primary system designed to favor extremists? In the military tent? Or walking our kids to school? We have, unintentionally, torn the fabric of our community. Still we could rewrite some of the rules that aggravated our polarization. But on Thursday, the Federal Communications Commission wants to eliminate net-neutrality and give a few large corporations control over what we see and hear. I’m concerned by which friends of FCC Chairman Ajit Pai would get control over our news sources. We’re going from chaos to monopoly. With Trump leading the charge against the most careful and professional news sources, it feels like we are headed to autocracy and bye-bye democracy. — This commentary was broadcast on WAMC Northeast Report, December 12, 2017. Many people in this country believe that the Founding Fathers established our Constitution to get government off of people’s backs. My wife and I just traveled to North Carolina where that idea is big. They expect people to take care of themselves without the help of the nanny state. We are all expected to earn and pay our own way. We were on the Outer Banks of North Carolina, in Nags Head, and traveled to Ocracoke Island by ferry. It is a lengthy ferry ride, about ten miles as it winds around shoals that would stop and probably destroy the boat. I chatted with one of the crew, an employee of the State of North Carolina, and told him that I hadn’t yet been told how much the trip would cost me. Nothing, he replied. It’s free. We were certainly prepared to pay our way. That’s quite a gift from the State of North Carolina. Still the good people of North Carolina, and certainly their elected representatives, know that government is nothing but a problem in the way of the people. So imagine our surprise when we stopped at the Ocracoke lighthouse to discover that the feds, those doggoned feds, built the light house in the eighteenth century, before the ink on the Constitution had much time to dry, and rebuilt a sturdier one in 1825 that is still working today to keep ships off the rocks and shoals. Then we mailed a couple of cards to our granddaughters. You guessed it – we relied on the Postal Service that the feds set up and ran since Ben Franklin, that old self-reliant founding patriot, ran the thing even before the Constitution was written. The old Founders, they certainly knew how to use the government to benefit the people. Guess no one told them they weren’t supposed to. Daily we checked NOAA, the National Oceanic and Atmospheric Administration, the federal agency that includes the weather service. Perhaps you didn’t realize it, but all those private meterologists on every television and radio station are basing their forecasts on weather data collected, analyzed and distributed by the federal weather service. Lawyers by the way, contact the weather service for information about the weather at the time of events being litigated – there’s no need to replicate Lincoln and his famous use of an almanac to get an acquittal for his client. Weather service data are recognized and relied on as authoritative virtually universally. We drove back on U.S. highways, both in North Carolina and between there and Albany. Yes roads the government built. In good shape too. In fact some of the first roads in the United States were postal roads, built by Uncle Sam. We had some great dinners. But I sure hope the health department was checking up on those places – it’s pretty darn hard for a traveler to know much about what’s going on in the kitchen. And we have sometimes had some pretty bad experiences despite our best efforts. I expect MORE from our government, not less. — This commentary was broadcast on WAMC Northeast Report, August 11, 2015. I’ve been celebrating like many of you over the marriage equality and Obamacare decisions last Thursday and Friday. But my own celebrations are tempered by the realization that these two cases don’t symbolize any shift on the Court. Kennedy’s libertarian philosophy has paid dividends in the gay rights controversy for years. But the decision last November to hear the case challenging whether federal health exchanges could provide subsidies to those without the money to buy a health plan unassisted, turned into a trap. The scale of damage that would have been done by blocking the subsidies made it impossible even for opponents of the program to shut it down. Nothing in the decision suggests that Kennedy had a change of heart about having wanted to declare it unconstitutional, and nothing suggests that Roberts had a change of heart about narrowing the commerce power, even though he had approved the individual mandate in the statute as a tax. 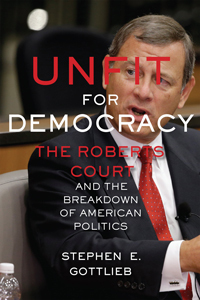 Twenty years ago, Thomas wrote he would consider going back to the Court’s very restrictive definition of federal powers before 1937 when President Franklin Roosevelt’s appointments changed the Court’s philosophy. Apparently Scalia and Alito are on Board with him. That brings me to raisins. Horne v. Department of Agriculture, looks like the Supreme Court is maneuvering to get us back to the era when it throttled government economic policy. Horne held unconstitutional a program to keep the supply of raisins on an even keel. Roosevelt’s New Deal Administration had the dream of an “ever normal granary” for farmers. Their prices were spiking in both directions, making farming very difficult especially for family farmers whose resources to endure periods of low prices were limited. The statute was passed in 1937 to create the “ever-normal granary,” in order to deal with the effects of the great depression, stabilize prices, preserve supplies against shortages from drought or other natural causes and to protect farmers against “disastrous lows” from bumper crops. The result was a program to store portions of crops in government facilities when supply exceeded demand and release them in periods when yields were too low. It was a program designed by farmers for farmers. The Horne decision used the takings clause to overrule part of that nearly eighty year old statute which had been designed to help pull the country out of the great depression of the ‘30s. If one simply reads the words of this Roberts Court decision, it looks easy to get around. Government could use a regulation or a tax. And there are other ways to make this decision seem appropriate and unthreatening. But I don’t believe it. This case has been part of a decade long set of challenges looking for a way to take down federal agricultural marketing policies. The attorney for the Hornes was a well-known conservative activist, professor and former judge. I doubt he handled this case just because he sympathized with the Hornes. Similarly, when the Rehnquist Court decided United States v. Lopez in 1995 on federalism grounds all the constitutional scholars said it was insignificant, a shot across the bow but portending nothing. Within a few years it was clear they were wrong. The Court started declaring civil rights statutes unconstitutional as violations of principles of federalism that are nowhere in the language of the Constitution. This case is not a one off. The Court has been developing takings doctrine so that it can be used to block federal regulation of the economy and the environment. The conservative faction on the Roberts Court is trying to develop legal tools to return the U.S. to a period in which we are a congerie of 50 small states instead of a single proud country. And if that happens, family farmers especially may be sorry to be free of federal regulation. — This commentary was broadcast on WAMC Northeast Report, June 30, 2015. Horne v. Dep’t of Agric., 2015 U.S. LEXIS 4064 (2015). Mordecai Ezekiel, Farm Aid-Fourth Stage, The Nation, February 26, 1938, Vol. 146, No. 9, p. 236-238, available at http://newdeal.feri.org/nation/na38146p236.htm. A week ago my students and I went to the U.S. Supreme Court and saw the argument in Bond v. United States. Carol Bond tried to poison Myrlinda Haynes because of an affair with Bond’s husband. Local authorities wouldn’t bother helping Haynes but sent her to the Postal Service, because poison was found in her mail and the Postal Service has the power to prosecute crimes involving the mail. The Postal Service set up a camera and caught Bond in the act. Postal inspectors arrested Bond and a federal grand jury indicted her for violating the Chemical Weapons Implementation Act. The United States is a party to the international Chemical Weapons Convention. Congress passed a statute to implement the Convention which prohibited “knowing possession or use, for nonpeaceful purposes, of a chemical that can cause death” or other harms. Treaties and state failure to execute them were a major reason for the Constitution, which gives Congress power to pass laws that are necessary and proper for carrying them out. You are currently browsing the archives for the Federalism category.